Browse > Home / When You Live at Lake Chapala where do you go on vacation? When You Live at Lake Chapala where do you go on vacation? beach peson” or just want to find another perhaps more historic place to visit you could do no better in my opinion that to go to the “Shinning City on a Hill”. A short half day drive from Lake Chapala – Ajijic is an almost fairyland adult Disney Land – like shining city of on a hill. The name of this magical place is Guanajuato which is located in the Mexican State of the same name and just a half day pleasant drive from Lake Chapala Ajijic. The altitude is a bit higher than here at Lake Chapala which is 5,000 ft. above sea level while Guanajuato is 6,550 ft. above sea level. BY the way, Guanajuato, the town and adjacent mines are a World Heritage Site. Dating from 1554 It’s located in one of the richest silver mining areas of Mexico, and is well known for its fine colonial era Spanish architecture. The city was originally built over the Guanajuato River, which flowed through tunnels underneath the city. However, after years of raising buildings to accommodate repeated flooding, in the mid-twentieth century, engineers built a dam and redirected the river into underground caverns. The tunnels were paved with cobblestones for automobile traffic, and this underground road network carries the majority of cars driving through the city today. So, Guanajuato is both a shining city on a hill and a city in part underground and this aspect is one of the most notable features of the city. To the west of the city is a famous cemetery noted for the natural mummies produced by unknown means. About 1 in 100 bodies buried here experience natural mummification. Here’s how the museum came to be: In the late 1800s the town instituted a “burial tax” for the families of the deceased. When some of the poorest families were unable to pay the tax, their relatives were dug up and placed on public view in what became the current museum. The ‘Guanajuato Mummy Museum’ still adds bodies to this day. The museum holds 111 mummified bodies resting on velvet pillows. 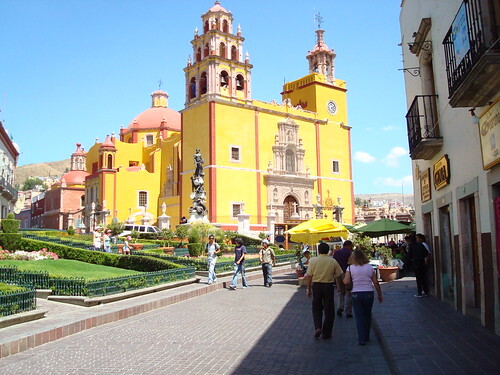 Guanajuato is more than history, interesting architecture, silver shops and museums however. 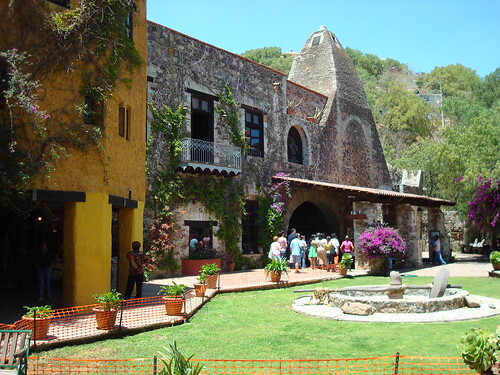 Guanajuato also hosts a number of events each year which are visited by people from all over the world. One of the more popular events held each Octrober is the Festival Internacional Cervantino, an international festival of the arts named after Miguel de Cervantes. The festival is especially popular for students from across central Mexico, but attracts participants and spectators from around the world. Now, here’s some practical tips if for visiting. From Guadalajara you take Highway 80 East and follow the signs for San Juan de los Lagos (St. John of the Lakes), Leon, and Guanajuato. Easiest to take the toll roads which will take you through 5 toll booths with the total tolls coming to 354 pesos each way as of April 2009 which at the current exchange rate comes out to about $26 USD. If you like anything made of leather a stop in Leon along the way going or coming is a good idea. There’s an outlet strip mall on the main highway on the North side of the highway through the center of Leon which sells all kinds of shoes and other leather items at very good discounts off retail. I bought a very stylish pair of side zip Florsheim half boots made in Mexico with leather lining for just $52 USD. I would estimate the cost would have been three times this or more if I had bought the same boots in the USA. In Guanajuato we stayed two nights and three days at the very old and very nice Hotel de Minas. It once was probably the nicest hotel in town as there were plaques on the wall depicting the times when the movie star Robert Mitchum and others stayed there during the filming of one of their movies years ago. Our room was very comfortable with good firm beds, plenty of hot water, and a balcony with a view of the city. An on site cyber café, gift shops and upscale restaurant on site rounded out the hotels amenities. Our room included a complete breakfast for two in the hotel dining room. All this for just $74 USD including taxes. Rather than navigate the twisting streets and tunnels we opted just to keep the car safely parked in the hotel parking garage and take a taxi to the downtown area ($2.23 USD for 2 persons) . One day we took an escorted tour of the museums and points of interest of the city we would have missed if we had just stumbled around on our own. The cost of the tour was just $7.44 USD per person plus the small entrance fees at the various museums. We did not need an escorted tour however to wander around the central core of the city and enjoy the great free entertainment at the bandstand in the center of downtown, to sit and have a two for one Pina Colada at a sidewalk café, or to have a very inexpensive tasty meal at one of the numerous out door restaurants. Surprisingly I only saw a total of about 6 pr 7 gringos in the three days we were in the area so some Spanish ability will be very helpful. The city was vibrant with lots of visitors, but not oppressive with pushing crowds and getting a table at a restaurant was not difficult at all. Given the beauty of the city, its many amenities like the free concerts in the park, and the very friendly and helpful residents, I can think of no better few days away from our own little slice of paradise here at Lake Chapala than a a short escape to the Shining City on the Hill, Guanajuato, Gto. Hi Sarah, Glad you enjoyed the article on Guanajuato. There are a lot of cool places to visit within a day or half day drive from here. Hi Shirley, Thanks for your questions and the kind words about http://www.ChapalaClub.com. You’re very much on the right track. The lead time to be able to find a suitable rental will vary with the time of the year. The busy rental season is “snow bird season” and the snow birds begin to look for rentals several weeks before they plan to be here. So, November, December and January are busy months. Then the second busy time is in the very hot months in the Southern USA June, July and August. Of course the rates are higher during these months for the same properties. Sometimes a single person can find a good deal on a rental by checking the local area bulletin boards where North Americans may be advertising a rental suitable for a single person. Often this is a small guest house(Casita) or an separate apartment with private entrance. This can save you some money as the rates will likely be lower (since the owner doesn’t need to pay a management firm). Of course I’d like to help you when you arrive and usually a couple of weeks notice is all I need to be sure and I will be available. So, let me know when you’d like to come down when you know to Sid@ChapalaClub.com and we can go from there.